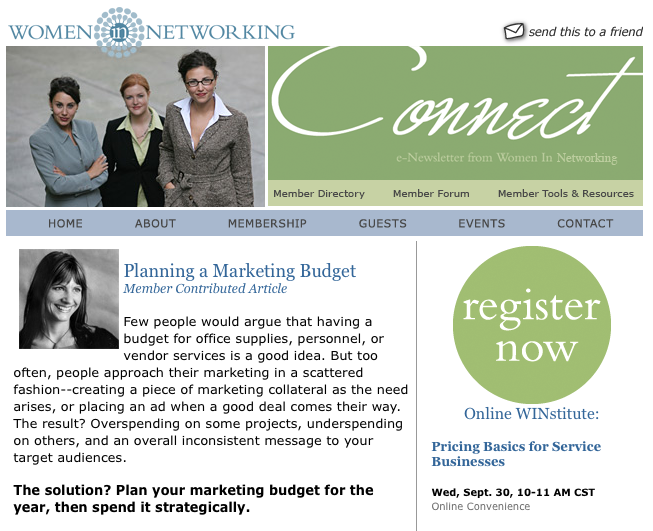 Minnesota Women in Networking selected Katrina Hase of Mix Creative to submit a member contributed article in the September 28 edition of the Connect e-newsletter. The article, Planning a Marketing Budget, was distilled from a longer post in the Mix Creative blog from September of 2008. The WIN Connect E-newsletter reaches over 1,350 women in business in the Twin Cities metropolitan area. Click here to see the e-newsletter in its entirety. This entry was posted on Friday, October 2nd, 2009 at 11:37 am and is filed under Awards and Honors, News from Mix. You can follow any responses to this entry through the RSS 2.0 feed. You can leave a response, or trackback from your own site.